For a video of this event click this link. The first Open House on Edmonton’s planned annexation, hosted by the County of Leduc, was held on Wednesday, April 2nd at the Nisku Recreation Center. This is the first of four planned Open Houses sponsored by the County and saw over 175 residents of Leduc County in attendance. The Nisku Recreation Center’s Open House drew the attention of all the major Edmonton News TV camera crews, which allowed many of the residents to air their concerns of the proposed annexation. The evening began with a welcome message and an introduction by Leduc County Mayor Whaley. Mayor Whaley then turned the meeting over to Moderator Neumann who walked the audience through the process of annexation and a presentation of how the annexation would affect the County if it were allowed to proceed unchanged. The information part of the evening ended with how the annexation process works as established by the province. An important point was made that the process has guidelines but not deadlines and that depending on how Edmonton and Leduc proceeded the annexation could take up to five or more years to be completed. After forty-five minutes the meeting began to take questions from the audience. One resident living close to the Edmonton line praised the city for its quick response to a family medical emergency and was also disappointed in the response of the County’s fire services back in 1992. He was the exception as many residents expressed disappointment in the services and taxes that are generated from Edmonton. One resident living south of 41st Avenue stated that the city leaves spraying for noxious weeds in drainage ditches to the nearest landowner while the County of Leduc manages the problem directly. Still other residents that had moved from homes in southern Edmonton complemented the County’s snow removal program compared to Edmonton’s. Still others told how their insurance rates had dropped over a thousand dollars as soon as their companies realized they lived in the County of Leduc. While other landowners warned that even though it may take up to fifty years before development occurs near them residents will be immediately under the City of Edmonton’s bylaws, services, and taxes once the annexation is finalized. When residents asked what they could do to express their concerns they were informed they could write their MLA’s. At this time Edmonton City Councilor Mike Nicol stood up to introduce himself and informed participants not to limit their concerns to their MLA’s but also to write to the various members on Edmonton’s City Council as many of them are new to the position and need to be informed of the issues from County of Leduc residents viewpoint. One young lady expressed her concern why the City of Edmonton is hosting a series of informational meetings in April that limits the participants to 25 invited guests instead of having it open to the public especially since they are using the Nisku Recreation Center which is capable of hosting far more people. 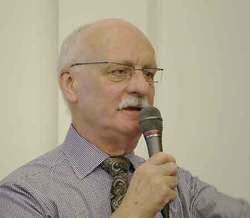 As more questions were asked by members of the audience about the procedures and time lines of the annexation process an uncommitted MLA George Rogers spoke to the concerns explaining the role of the province government. Future Open Houses will be held in Glen Park on Thursday, April 17th, at Sunnybrook on Wednesday, April 23rd, and on Tuesday, April 29th at Rolly View community centers beginning at 7pm.